A myriad of preaching methodologies vie for prominence in the pulpit, but what option fits a scriptural view of preaching? Southwestern Seminary believes text-driven preaching answers that question. 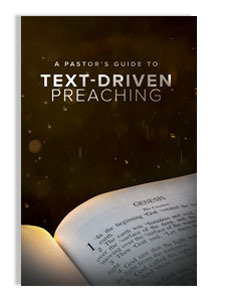 But what is text-driven preaching? How is it done? What are its essential elements? And what does the Bible say about this preaching method? Each of these questions and more are addressed in this concisely written tool for the local pastor who strives to faithfully present the revelation of God to His people. Each of these chapters is written by a member of Southwestern Seminary’s School of Preaching faculty, including Dean David Allen, (former) Professor of Communication Steven Smith, Associate Professor of Preaching Matthew McKellar, and (former) Southwestern President Paige Patterson. The chapters are derived from articles and lectures by these men designed to aid pastors in text-driven preaching.